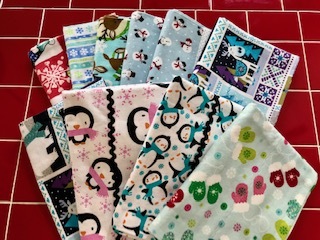 More beautiful Christmas flannel pillow cases made by Brenda Brakke of Billings, Montana. She has been a huge help with sending so many pillow cases for the various projects. These are going to the Ronald McDonald House. Thank you Brenda for being such a wonderful contributor. 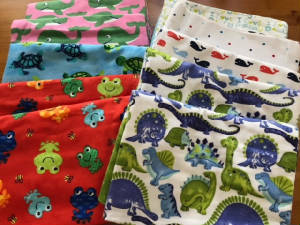 Some adorable pillowcases perfect for a new hospital that will be given to the children that are going through chemo. They will absolutely love these. Thank you Brenda Brakke in Billings, Montana for your beautiful handmade cases. A very special thank yoiu to Deanna Stark, Patty Cortez and Maribel Rodriguez. These ladies made these beautiful crochet hats for the preemie babies at St. Charles Hospital. I am so appreciative for these ladies that meet and make the cutest items for various charities. It's all about giving back and they are surely doing that. 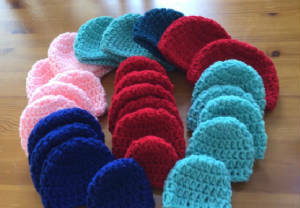 I'm blessed that the preemies will be nice and warm with these adorable hats. Thanks ladies ! This family owned sticker company began over 35 years ago by Andrea Grossman. She was the first to introduce stickers by the yard. 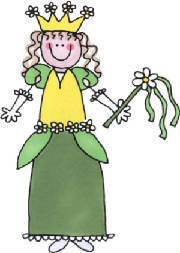 The stickers are sold all over the world and the business is located in the wonderful town of Petaluma. Over the past 20 years, they have donated over 20 million stckers to children in hospitals all over the world. Her son Jason has been part of the business for over 20 years. Stop by and say hello if you are ever in the area. I am so blessed by their genorosity. They were so kind hearted with sending me hundreds of stickers for me to send along in the packages to the Hospitals and Children's Homes. The teens will love these along with the little kids. I am so very grateful that they have been so generous in helping make the holidays so much better for the children. Afterall, what child, or adult doesn't love stickers? I am so thankful for them being part of this journey ! Adena Rojan ~ Little Rock, AK. The pink ♥ is who our biggest supporter is to date. Renee Adair ~ Miller Place, N.Y.